Last Tuesday, facing a New York Times story that would publish his emails with British publicist Rob Goldstone, Donald Trump Jr. tweeted out the full text of his conversations leading to a meeting with Russian lawyer Natalia Veselnitskaya. In those conversations Goldstone told Trump Jr., “This is very obviously very high level and sensitive but is part of Russia and its government’s support for Mr. Trump.” The communiqué promised that Veselnitskaya, an attorney with links to the Kremlin, would provide damaging information on Mr. Trump’s opponent Hillary Clinton. On June 9th, Trump, Jr., Jared Kushner, and Paul Manafort, then chair of the Trump campaign, met with Veselnitskaya and Rinat Akhmetshin, a lobbyist and former Russian intelligence officer, for what Trump Jr. has now called a “waste of twenty minutes” where Veselnitskaya, he says, revealed nothing and wanted to talk about Russian adoptions. In an effort to combat the predictably bad press, Trump Jr. has claimed this came before “Russia Mania,” or the media’s interest in the collusion story, and conservative pundits have gone out of their way to claim that Trump Jr. and Kushner, relatively new to politics at the time, couldn’t have known that such a meeting might be problematic. What people are forgetting, however, is the third man on the Trump side of the table that day, a figure who played an integral role in the campaign’s relationship and, considering his wealth of experience in dealing with the Russians, knew the implications well before ever walking into the room. I first heard the rumor about the Trump campaign colluding with Russia on July 25th, 2016, as I rode the Paoli/Thorndale line into the heart of Philadelphia. It was the first day of the Democratic National Convention and a dark cloud hung over the party as, three days earlier, a cache of DNC emails had been released by WikiLeaks, a bombshell that had already cost DNC chair Debbie Wasserman Schulz her job and had worked Bernie Sanders’s most rabid supporters into a lather that would result in wild protests in the streets outside the convention. The information I was given then, and in the weeks following, all centered around Paul Manafort, a relatively obscure figure most well known for his work for Gerald Ford’s 1976 Republican National Convention delegate team, who had somehow risen to be the top man in Donald Trump’s campaign. Manafort had been brought onboard when it appeared that Trump might face a contested convention, the first since the ’76 affair, and had been an insurance policy in case the fight for the nomination got ugly. When Manafort joined the effort the campaign was headed by Corey Lewandowski, a Trump insider whose presence grew increasingly toxic when, in March, he put his hands on a reporter at a rally and then, days later, was filmed doing so again with a protestor. Those actions, coupled with an escalating rivalry with Manafort, led to Lewandowski leaving his position and ceding leadership of the campaign. Immediately, those in the campaign loyal to Lewandowski began expressing doubt regarding Manafort’s abilities and, even more so, his intentions. Prior to his helming of the Trump campaign, Manafort’s last roles in mainstream Republican politics had been as an adviser to George H.W. Bush’s inaugural presidential run in 1988 and Bob Dole’s failed bid in 1996. Trump campaign members, especially those still bitter over Lewandowski’s ouster, wondered loudly how a political dinosaur like Manafort could possibly gain control of a presidential campaign, particularly a winning one, in 2016. The other question they wondered: just what had Manafort been up to in the past twenty years? Last month, in a story that unfortunately went under the radar, Paul Manafort retroactively registered as a foreign agent for the years of 2012 – 2014, a period of time in which his consulting firm was paid roughly $17 million dollars by Ukraine’s Party of Regions, a pro-Russia group whose leader Viktor Yanukovych fled to Russia after impeachment. The event, monumental in implications, was largely disregarded because Manafort had been ousted as head of the Trump campaign in August of 2016 after ledgers were discovered in Ukraine that tied Manafort to under-the-table cash payments from the Party of Regions. Questions had begun to swirl regarding Manafort interactions with not just the Party of Regions, but associates linked back to Russian intelligence operations, and with rumors of collusion swirling, his continued presence in the campaign was untenable. With Manafort’s resignation much of the stink he’d brought to the campaign dissipated. There was the story of how, under his direction, the Trump campaign had insisted on the Republican National Convention’s platform committee softening its language on Ukraine. Suspicion that Donald Trump’s faith in NATO had been shaken. And the odd moment, on July 27th, where Trump, during a press conference, looked into the television cameras and asked Russians to find Hillary Clinton’s missing emails, a moment one of my sources told me he’d been convinced, once and for all, that there was something to the rumors that’d been circulating through Trump World. If anything, Manafort’s experience with the Party of Regions testifies to his experience within the realm of Russian international affairs. The Party of Regions’ close ties to the Russian government, and Manafort’s work, demands an understanding of the delicate nature of international conversations and Russian intelligence. It is virtually impossible, therefore, that Manafort, as head of the Trump campaign in 2016, didn’t know the full ramifications of meeting with Veselnitskaya and Akhmetshin, especially considering Goldstone himself had identified the meeting as part of Russia’s effort to aid the campaign and given Akhmetshin’s past in intelligence. The continued excuses and explanations regarding this meeting simply fall apart once Manafort is added to the equation. Trump, Jr. and Jared Kushner are admittedly newcomers to the field of international politics, but Manafort’s experience began in 1985 when he lobbied for an Angolan rebel group called UNITA and continued for years as his work increasingly centered on Eastern European accounts within Russia’s sphere of influence. Manafort’s experience and familiarity mean he was anything but ignorant of the ramifications and consequences of taking the meeting in June of 2016. Unfortunately, much as his registering as a foreign agent went unnoticed, Manafort’s presence in the room has been underplayed so far. 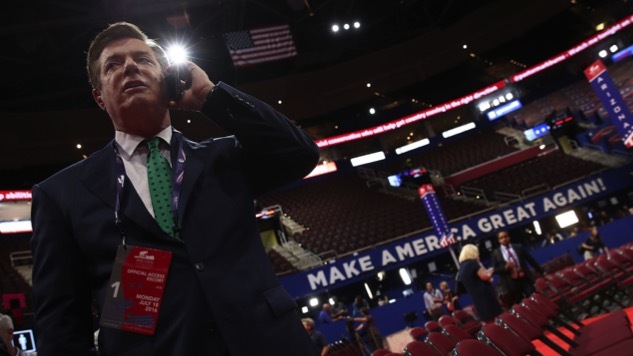 With his departure in August of last year, Manafort’s tenure as chair of the campaign continues to be largely forgotten and his part in these events hidden. Still, there are those from the campaign who wonder what changed the direction in the Summer of 2016. They question how Paul Manafort could have risen from a delegate adviser to the top of the outfit in less than three months, as well as how his two month tenure included a litany of Russia-related scandals, and, even more so, how other questions aren’t being asked, like how General Michael Flynn, who enjoys his own dubious ties to Russia and later resigned from the administration after lying about conversations with an ambassador, came to be a come-from-nowhere vice-presidential candidate under Manafort’s guidance. As the Trump/Russia story holds the country rapt, these questions, and many more, continue not to be asked. Even as daily reports continue to break regarding which Russian associates came to Trump Tower that June day, the stories continue to miss the integral figure who was right there the entire time. Jared Yates Sexton is an author, academic, and journalist whose work has appeared in The New York Times, The New Republic, Politico, Salon, and elsewhere. He’s the author of the forthcoming book The People Are Going To Rise Like The Waters Upon Your Shore: A Story of American Rage and currently serves as an Assistant Professor of Creative Writing at Georgia Southern University.